Home Maintenance & Repair How much “reserve load” or “headroom” is enough in a tire? I’ve been following an RV forum discussion on how much extra load capacity or “reserve load” or “headroom” is enough in a tire. Some folks had moved from LR-C (Load Range C) to LR-D; others to LR-G, but were concerned about running the tire sidewall pressure as it would be too hard on the trailer. There was also some confusion about the “Maximum” allowable inflation. “The inflation on a tire sidewall is the MINIMUM inflation pressure needed to support the MAXIMUM load (also molded on the tire sidewall). There is a sound scientific reason to run higher inflation when running tires on multi-axle trailers: It is called “interply shear.” This force is what can result in belt/tread separations. I have covered this in detail along with references to technical papers on the topic. “I wish it were that simple, but all radial tires have the interply shear force. It’s a question of how much “tire life” is being “used up.” The force results in microscopic cracks forming between the two steel belts at the outer edge. Once cracks form they do not repair themselves but can only grow. No good tool or math model can turn shear force into miles of tire life “consumed” as there are just too many variables. Finite element models simply indicate that higher inflation can result in lower shear force every time you turn a corner or every time a tire completes a revolution. About the best you can do is to do a close visual inspection (free spin) to look for signs or out of round or side-to-side runout, which are strong indicators of internal structural tears. I have a video and pictures of the autopsy I did on a tire where you can see the separations running across 50% to 70% of the tread width. This large separation might run a thousand miles or under certain circumstances might fail tomorrow. Think of it like your blood pressure: Higher is worse. So the question is at what number can you expect to have a fatal attack? If you consult your owner’s manual you will see a suggestion that 3 to 5 years is the max expected life, but obviously someone that runs at or above Max Load, and above 65 mph, and drives 4,000 miles a year is more likely to suffer a failure than someone that only drives 2,000 miles, never faster than 62, and at only 80% of tire load capacity. Moving up one Load Range C>D or D>E can probably expect longer tire life if they also go from 50 to 65, or 65 to 80 psi. Going to LR-G in a Commercial-grade all-steel tire should result in longer life even if you don’t run 110 psi. I realize this is a long-winded post but, hopefully, you can think about the ideas and concepts we are discussing. Easy questions do not always get simple answers, especially when talking about a complex topic. Previous articleCampground of the future? You’re kidding, right? 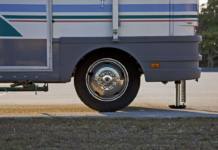 RV Tire Safety – “China bomb” tires and McDonald’s fries? What?